CAPE CANAVERAL AIR FORCE STATION, FL — A gap filling space surveillance satellite that will track orbiting threats for the U.S. Air Force is set for an thrilling nighttime blastoff Friday, Aug. 25 on the maiden mission of the Minotaur IV rocket from Cape Canaveral that’s powered by a retired Cold War-era ICBM missile – once armed with nuclear warheads. The ORS-5 satellite will provide the US military with space-based surveillance and tracking of other satellites both friend and foe as well as space debris in geosynchronous orbit, 22,236 miles above the equator. The Orbital ATK Minotaur IV rocket carrying the ORS-5 tracking satellite for the USAF Operationally Responsive Space Office is targeting liftoff just before midnight Friday at 11:15 p.m. EDT from Space Launch Complex-46 (SLC-46) at Cape Canaveral Air Force Station. “We are go for launch of Orbital ATK’s Minotaur IV rocket Friday night,” Orbital ATK confirmed. The ORS-5 mission, which stands for Operationally Responsive Space-5, marks the first launch of a Minotaur IV rocket from Cape Canaveral and the first use of SLC-46 since 1999. The Minotaur IV is a five stage rocket comprised of three stages of a decommissioned Cold War-era Peacekeeper Intercontinental Ballistic Missile (ICBM) that has been modified to add two additional Orbital ATK Orion 38 solid rocket motors for the upper stages. Being a night launch and the first of its kind will surely make for a spectacular sky show. Plus if you want to see how the world could potentially end in nuclear catastrophy, come watch the near midnight launch of the Orbital ATK Minotaur IV rocket that’s a retired Peacekeeper ICBM once armed with nuclear warheads aimed at the Russians but now carrying the USAF ORS-5 surveillance satellite instead. Its well worth your time if you can watch the Minotaur launch with your own eyeballs. It can be easily viewed from numerous local area beaches, parks, restaurants and more. Furthermore, its been in a super busy time at the Kennedy Space Center and Cape Canaveral. Because, if all goes well Friday’s midnight launch will be the third in just 11 days – and the second in a week! A ULA Atlas V launched the NASA TDRS-M science relay satellite last Friday, Aug 18. And a SpaceX Falcon 9 launched the Dragon CRS-12 cargo resupply mission to the International Space Station (ISS) on Monday, Aug. 14. The live Orbital ATK broadcast will begin approximately 20 minutes before the launch window opens. The webcast will be hosted by former CNN space reporter John Zarrella. The launch window opens at 11:15 p.m. EDT August 25. It extends for four hours until 3:15 a.m. EDT August 26. In the event of delay for any reason, the next launch opportunity is Saturday, Aug. 26. The launch window remains the same from 11:15 p.m. EDT August 26 to 3:15 a.m. EDT August 27. The weather looks somewhat iffy at this time with only a 60% chance of favorable conditions at launch time according to U.S. Air Force meteorologists with the 45th Space Wing Weather Squadron at Patrick Air Force Base. The primary concerns on Aug. 25 are for thick clouds and cumulus clouds. The weather odds deteriorate to only 40% favorable for the 24 hour scrub turnaround day on Aug. 26. The primary concerns on Aug. 26 are for thick clouds, cumulus clouds and lightning. ORS-5 is like a telescope wrapped in a satellite that will aim up to seek threats from LEO to GEO. ORS-5, also known as SensorSat, is designed to scan for other satellites and debris to aid the U.S. military’s tracking of objects in geosynchronous orbit for a minimum of three years and possibly longer if its on boards sensor and satellite systems continue functioning in a useful and productive manner. The ORS-5 satellite has a payload mass of 140 kg. It will be launched into a low inclination equatorial orbit of 600 km x 600 km (373 mi x 373 mi) at zero degrees. “This will be the largest low-Earth orbit inclination plane change in history – 28.5 degrees latitude to equatorial orbit,” says Orbital ATK. The Cape Canaveral AFB launch site for this Minotaur IV was chosen, rather than NASA’s Wallops Flight Facility in Virginia based on the final orbit required for ORS-5, Orbital ATK told Universe Today at a prelaunch media briefing. The Minotaur IV is not powerful enough to deliver ORS-5 to the desired orbit from Wallops. ORS-5 was designed and built by Massachusetts Institute of Technology’s Lincoln Laboratory facility in Lexington, Massachusetts at a cost of $49 million. In July 2015 the U.S. Air Force’s Operationally Responsive Space (ORS) Office awarded Orbital ATK a $23.6 million contract to launch the ORS-5 SensorSat on the Minotaur IV launch vehicle. ORS-5/SensorSat was processed for launch and encapsulation inside the 2.3 meter diameter payload fairing at Astrotech Space Operations processing facility in Titusville, Florida. The Minotaur IV is quite similar to Orbital ATK’s Minotaur V launch vehicle which successfully propelled NASA’s LADEE lunar orbiter to the Moon for NASA during a night launch from the agency’s Wallops Flight Facility in Virginia in Sept. 2013. The Minotaur V also utilizes the first three stages of the decommissioned Peacekeeper ICBM missile. Overall the ORS-5 launch will be the 26th blastoff in Orbital ATK’s Minotaur family of launch vehicles which enjoy a 100% success rate to date. The U.S. Air Force has a stockpile of about 180 surplus Peacekeeper motors, but not all are launch capable, the USAF told Universe Today at a prelaunch media briefing. The USAF furnishes the Peacekeeper motors to Orbital ATK after first refurbishing the booster stages at Vandenberg AFB, Ca. Orbital ATK then upgrades the stages by adding their own “flight-proven avionics, structures, software and other components that are common among Orbital ATK’s space launch vehicles” and integrating the firms Orion 38 solid rocket motors for the two upper stages. “A combined government and contractor team of mission partners executed final ground activities including a Launch Base Compatibility Test to verify satellite integrity after shipment, an intersegment test to verify communication compatibility from the satellite to the on-orbit operations center and the final battery reconditioning for launch, prior to its integration with the Minotaur IV launch vehicle,” says the USAF. Watch for Ken’s continuing onsite Minotaur IV ORS-5, TDRS-M, CRS-12, and NASA and space mission reports direct from the Kennedy Space Center and Cape Canaveral Air Force Station, Florida. KENNEDY SPACE CENTER, FL – Today marked the end of an era for NASA as the last of the agency’s next generation Tracking and Data Relay Satellites (TRDS) that transmit the critical science data and communications for the Hubble Space Telescope and human spaceflight missions to the International Space Station, successfully rocketed to orbit this morning, Fri. Aug 18 from the Florida Space Coast. The spectacular liftoff of the strangely fish-like TDRS-M science relay comsat atop a United Launch Alliance Atlas V rocket occurred at 8:29 a.m. EDT a.m. (2:29 GMT) Aug. 18 from Space Launch Complex 41 at Cape Canaveral Air Force Station. The weather cooperated with relatively thin but artistic clouds and low winds and offered spectators a spectacular launch show that will not forget. NASA’s $408 million next generation Tracking and Data Relay Satellites (TRDS) looks like a giant alien fish or cocooned creature. But actually plays an unparalleled role in relaying critical science measurements, research data and tracking observations gathered by the International Space Station (ISS), Hubble and a plethora of Earth science missions. “TDRS is a critical national asset have because of its importance to the space station and all of our science missions, primarily the Hubble Space Telescope and Earth science missions that use TDRS,” said Tim Dunn, NASA’s TDRS-M launch director. TDRS-M will provide high-bandwidth communications to spacecraft in low-Earth orbit. The TDRS network enables continuous communication with the International Space Station, the Hubble Space Telescope, the Earth Observing System and other programs supporting human space flight, said satellite builder Boeing, the prime contractor for the mission. TDRS-M is the last of three satellites to be launched in the third generation of TDRS satellites. It is also the final satellite built based on Boeing’s 601 spacecraft bus series. NASA plans to switch to much higher capacity laser communications for the next generation of TDRS-like satellites and therefore opted to not build a fourth third generation satellite after TDRS-M.
“The TDRS fleet is a critical connection delivering science and human spaceflight data to those who can use it here on Earth,” said Dave Littmann, the TDRS project manager at NASA’s Goddard Space Flight Center in Greenbelt, Maryland. TDRS-M joins a constellation of 9 TDRS satellites already in orbit and ups the fleet to ten orbiting satellites. The Atlas V rocket and Centaur upper stage delivered TDRS-M to its desired preliminary orbit. “Trajectory analysis in. Injection accuracy was within 1% of prediction #TDRSM,” tweeted ULA CEO Torey Bruno. Several hours after the launch ground controllers reported the satellite was in good health. On tap now is a four month period or orbit checkout by prime contractor Boeing as well as a series of five significant orbit raising maneuvers from its initial orbit to Geostationary orbit over the Pacific Ocean. “This TDRS-M milestone is another step forward in Boeing’s commitment to developing technologies to support future NASA near-Earth, moon, Mars and deep space missions – and to do so affordably, drawing on our 40-plus years of strong Boeing-NASA partnership,” said Enrico Attanasio, executive director, Department of Defense and Civil Programs, Boeing Satellite Systems. Ground controllers will then move it to its final orbit over the Atlantic Ocean. NASA plans to conduct additional tests before putting TDRS-M into service early next year over the Atlantic. The importance of the TDRS constellation of satellites can’t be overstated. Virtually all the communications relay capability involving human spaceflight, such as the ISS, resupply vehicles like the SpaceX cargo Dragon and Orbital ATK Cygnus and the soon to launch human space taxis like crew Dragon, Boeing Starliner and NASA’s Orion deep space crew capsule route their science results voice, data, command, telemetry and communications via the TDRS network of satellites. The TDRS constellation enables both space to space and space to ground communications for virtually the entire orbital period. The two stage Atlas V rocket stands 191 feet tall. TDRS-M, spacecraft, which stands for Tracking and Data Relay Satellite – M is NASA’s new and advanced science data relay communications satellite that will transmit research measurements and analysis gathered by the astronaut crews and instruments flying abroad the International Space Station (ISS), Hubble Space Telescope and over 35 NASA Earth science missions including MMS, GPM, Aura, Aqua, Landsat, Jason 2 and 3 and more. The TDRS constellation orbits 22,300 miles above Earth and provide near-constant communication links between the ground and the orbiting satellites. TRDS-M will have S-, Ku- and Ka-band capabilities. Ka has the capability to transmit as much as six-gigabytes of data per minute. That’s the equivalent of downloading almost 14,000 songs per minute says NASA. The TDRS program is managed by NASA’s Goddard Space Flight Center in Greenbelt, Maryland. TDRS-M is the third satellite in the third series of NASA’s American’s most powerful and most advanced Tracking and Data Relay Satellites. It is designed to last for a 15 year orbital lifetime. The first TDRS satellite was deployed from the Space Shuttle Challenger in 1983 as TDRS-A. TDRS-M was built by prime contractor Boeing in El Segundo, California and is the third of a three satellite series – comprising TDRS -K, L, and M. They are based on the Boeing 601 series satellite bus and will be keep the TDRS satellite system operational through the 2020s. TDSR-K and TDRS-L were launched in 2013 and 2014. The Tracking and Data Relay Satellite project is managed at NASA’s Goddard Space Flight Center. TDRS-M was built as a follow on and replacement satellite necessary to maintain and expand NASA’s Space Network, according to a NASA description. The gigantic satellite is about as long as two school buses and measures 21 meters in length by 13.1 meters wide. It has a dry mass of 1800 kg (4000 lbs) and a fueled mass of 3,454 kilogram (7,615 lb) at launch. Watch for Ken’s continuing onsite TDRS-M, CRS-12, ORS 5 and NASA and space mission reports direct from the Kennedy Space Center and Cape Canaveral Air Force Station, Florida. KENNEDY SPACE CENTER, FL – The last of NASA’s next generation Tracking and Data Relay Satellites (TRDS) that looks like a giant alien fish or cocooned creature but actually plays an absolutely vital role in relaying critical science measurements, research data and tracking observations gathered by the International Space Station (ISS), Hubble and a plethora of Earth science missions is poised for blastoff Friday, Aug. 18, morning from the Florida Space Coast. Liftoff atop a United Launch Alliance Atlas V rocket of NASA’s $408 million eerily insectoid-looking TDRS-M science relay comsat atop a United Launch Alliance (ULA) Atlas V rocket is scheduled to take place from Space Launch Complex 41 at Cape Canaveral Air Force Station at 8:03 a.m. EDT (2:03 GMT) Aug. 18. The Atlas V/TDRS-M launch stack was rolled out from the ULA Vertical Integration Facility (VIF) to pad 41 Wednesday morning, Aug 16 starting at about 9:10 a.m. EDT. The quarter mile move took about 50 minutes and went off without a hitch. The rocket and spacecraft sailed through the Flight Readiness Review (FRR) and Launch Ready Review (LRR) over the past few days conducted by NASA, ULA and Boeing and the contractor teams. You can witness the launch with you own eyes from many puiblic beaches, parks and spots ringing the Kennedy Space Center. If you can’t personally be here to witness the launch in Florida, you can always watch NASA’s live coverage on NASA Television and the agency’s website. The launch window opens at 8:03 a.m. EDT extends for 40 minutes from 8:03 a.m. to 8:43 a.m. In the event of delay for any reason, the next launch opportunity is Saturday, Aug. 19 with NASA TV coverage starting about 7:30 a.m. EDT. The launch window opens at 7:59 a.m. EDT. The weather looks quite good at this time with an 80% chance of favorable conditions at launch time according to U.S. Air Force meteorologists with the 45th Space Wing Weather Squadron at Patrick Air Force Base. The primary concerns on Aug. 18 are for thick clouds and cumulus clouds. The odds remain at 80% favorable for the 24 hour scrub turnaround day on Aug. 19. The launch was originally scheduled for Aug. 3 but was delayed a few weeks when the satellite’s Omni S-band antenna was damaged during final spacecraft closeout activities. The Omni S-band antenna was bumped during final processing activities prior to the planned encapsulation inside the nosecone, said a Boeing official at the prelaunch media briefing and had to be replaced and then retested. It is critical to the opening phases of the mission for attitude control. The TDRS constellation enables both space to space and space to ground communcations for virtually the entire orbital period. Plus it’s a super busy time at the Kennedy Space Center. Because, if all goes well Friday’s launch will be the second this week! The excitement of space travel got a big boost at the beginning of the week with the lunchtime blastoff of a SpaceX Falcon 9 and Dragon spacecraft on a cargo mission carrying 3 tons of science and supplies to the space station. Read my onsite articles here. The success of Monday’s SpaceX cargo Dragon rendezvous and berthing to the ISS is virtually entirely dependent on the TDRS network of satellites. That network will be enhanced with Fridays planned liftoff of NASA’s TDRS-M science relay comsat. TDRS-M looks like a giant insect – or a fish depending on your point of view. It was folded into flight configuration for encapsulation in the clean room and the huge pair of single access antennas resembled a cocoon or a cicada. The 15 foot diameter single access antennas are large parabolic-style antennas and are mechanically steerable. What does TDRS do? Why is it important? How does it operate? “The existing Space Network of satellites like TDRS provide constant communications from other NASA satellites like the ISS or Earth observing satellites like Aura, Aqua, Landsat that have high bandwidth data that needs to be transmitted to the ground,” TDRS Deputy Project Manager Robert Buchanan explained to Universe Today during an interview in the Astrotech clean room. TDRS-K and TDRS-L were launched in 2013 and 2014. TDRS-M will blastoff on a ULA Atlas V in the baseline 401 configuration, with no augmentation of solid rocket boosters on the first stage. The payload fairing is 4 meters (13.1 feet) in diameter and the upper stage is powered by a single-engine Centaur. TDRS-M will be launched to a Geostationary orbit some 22,300 miles (35,800 km) above Earth. “The final orbital location for TDRS-M has not yet been determined,” Buchanen told me. The Atlas V booster was assembled inside the Vertical Integration Facility (VIF) at SLC-41 and was rolled out to the launch pad 2 days before liftoff with the TDRS-M science relay comsat comfortably encapsulated inside the nose cone. Carefully secured inside its shipping container, the TDRS-M satellite was transported on June 23 by a US Air Force cargo aircraft from Boeing’s El Segundo, California facility to Space Coast Regional Airport in Titusville, Florida, for preflight processing at Astrotech. KENNEDY SPACE CENTER, FL – A triad of August liftoffs from the Florida Space Coast inaugurates Monday, Aug. 14 with a science laden commercial SpaceX Dragon bound for the International Space Station (ISS) – loaded with over 3 tons of NASA science, hardware and supplies including a cosmic ray detector, medical research experiments dealing with Parkinson’s disease and lung tissue, vegetable seeds, mice and much more, following a successful engine test firing of the Falcon 9 booster on Thursday. Check out our photos & videos herein of the Aug. 10 static first test of the Falcon 9 first stage that paves the path to blastoff – as witnessed live by Ken Kremer and Jeff Seibert. The triple headed sunshine state space spectacular kicks off with Monday’s lunchtime launch of the next unmanned SpaceX Dragon cargo freighter to the ISS from seaside pad 39A at NASA’s Kennedy Space Center in Florida, now targeted for Aug. 14 at 12:31 p.m. EDT (1631 GMT). The closely spaced trio of space launches marches forward barely 4 days later with liftoff of NASA’s amazingly insectoid-looking TDRS-M science relay comsat slated for Friday morning Aug. 18 atop a United Launch Alliance (ULA) Atlas V rocket. Lastly, a week after TDRS-M and just 11 days after the SpaceX Dragon an Orbital ATK Minotaur 4 rocket is due to blastoff just before midnight Aug. 25 and carry the ORS 5 mission to orbit for the U.S. military’s Operationally Responsive Space program. The Minotaur IV utilizes three stages from decommissioned Peacekeeper ICBMs formerly aimed at the Russians. Of course getting 3 rockets off the ground from 3 different companies is all highly dependent on Florida’s hugely fickle hurricane season weather and the ever present reality of potential technical glitches, errant boaters and more – possibly resulting in a domino effect of cascading launch scrubs. And sandwiched in between the Florida Space Coast blastoffs is the Total Solar ‘Eclipse Across America’ on Monday, Aug. 21 – for the first time in 99 years! Although KSC and central Florida are not within the path of totality, the sun will still be about 85% obscured by the Moon. So if you’re looking for bang for the space buck, the next two weeks have a lot to offer space and astronomy enthusiasts. The Dragon resupply ship dubbed Dragon CRS-12 counts as SpaceX’s twelfth contracted commercial resupply services (CRS) mission to the International Space Station for NASA since 2012. The 20-foot high, 12-foot-diameter Dragon CRS-12 vessel is carrying more than 6,400 pounds ( 2,900 kg) of science experiments and research instruments, crew supplies, food water, clothing, hardware, gear and spare parts to the million pound orbiting laboratory complex. 20 mice are also onboard. This will support dozens of the 250 research investigations and experiments being conducted by Expedition 52 and 53 crew members. The SpaceX/Dragon CRS-12 launch coverage will be broadcast on NASA TV beginning noon on Aug. 14 with additional commentary on the NASA launch blog. SpaceX will also offer their own live webcast beginning approximately 15 minutes before launch at about 12:16 p.m. EDT. In the event of delay for any reason, the next launch opportunity is Tuesday, Aug. 15 with NASA TV coverage starting about 11:30 a.m. EDT. The weather looks decent at this time with a 70% chance of favorable conditions at launch time according to U.S. Air Force meteorologists with the 45th Space Wing Weather Squadron at Patrick Air Force Base. The primary concerns on Aug. 14 are cumulus clouds and the potential for precipitation in the flight path. The odds remain at 70% favorable for the 24 hour scrub turnaround day on Aug. 15. Everything is currently on track for Monday’s noontime launch of the 230 foot tall SpaceX Falcon 9 on the NASA contracted SpaceX CRS-12 resupply mission to the million pound orbiting lab complex. However since the launch window is instantaneous there is no margin for error. In case any delays arise during the countdown due to technical or weather issues a 24 hour scrub to Tuesday will result. The lunchtime launch coincidently offers a convenient and spectacular opportunity for fun for the whole family as space enthusiasts flock in from around the globe. Plus SpaceX will attempt a land landing of the 156 foot tall first stage back at the Cape at Landing Zone 1 some 8 minutes after liftoff – thus a double whammy of space action ! !– punctuated by multiple loud sonic booms at booster landing time that will figuratively knock your socks off. To date SpaceX has successfully recovered 13 boosters; 5 by land and 8 by sea, over the past 18 months. It’s a feat straight out of science fiction but aimed at drastically slashing the high cost of access to space. The recent BulgariaSat-1 and Iridium-2 missions counted as the eighth and ninth SpaceX launches of 2017. CRS-12 marks the eleventh SpaceX launch of 2017 and will establish a new single year record. In contrast to the prior CRS-11 mission which flew a recycled Dragon, the CRS-12 Dragon is newly built. The CRS-12 Dragon will be the last newly built one, says NASA. The remaining SpaceX CRS mission will utilize reused spaceships. The Falcon 9 is also new and will attempt a land landing back at the Cape at Landing Zone-1 (LZ-1). If the Aug. 14 launch occurs as scheduled, the Dragon will reach its preliminary orbit about 10 minutes later and deploy its life giving solar arrays. Dragon then begins a 2 day orbital chase of the station via a carefully choreographed series of thruster firings that bring the commercial spacecraft to rendezvous with the space station on Aug. 16. Dragon will be grappled with the station’s Canadian built robotic arm at approximately 7 a.m. EDT on Aug. 16 by astronauts Jack Fischer of NASA and Paolo Nespoli of ESA (European Space Agency). It then will be installed on the Harmony module. The Dragon spacecraft will spend approximately one month attached to the space station, returning to Earth in mid-September with results of earlier experiments. Dragon CRS-12 is SpaceX’s third contracted resupply mission to launch this year for NASA. The prior SpaceX cargo ships launched on Feb 19 and June 3, 2017 on the CRS-10 and CRS-11 missions to the space station. 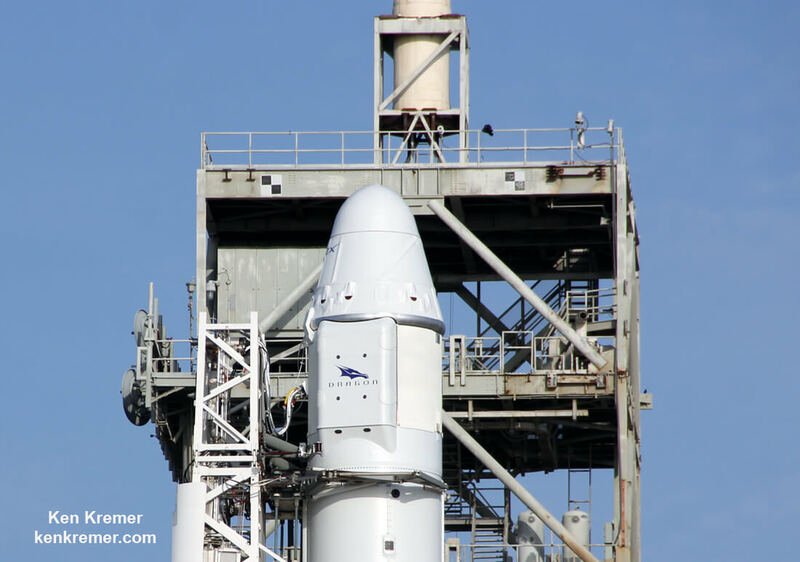 CRS-10 is further noteworthy as being the first SpaceX launch of a Falcon 9 from NASA’s historic pad 39A. SpaceX leased pad 39A from NASA in 2014 and after refurbishments placed the pad back in service this year for the first time since the retirement of the space shuttles in 2011. Previous launches include 11 Apollo flights, the launch of the unmanned Skylab in 1973, 82 shuttle flights and five SpaceX launches. The CREAM instrument from the University of Maryland will be stowed for launch inside the Dragon’s unpressurized trunk. Astronauts will use the stations robotic arm to pluck it from the trunk and attach it to the exposed porch of the Japanese Experiment Module (JEM). The Cosmic Ray Energetics and Mass (CREAM) instrument, attached to the Japanese Experiment Module Exposed Facility, measures the charges of cosmic rays ranging from hydrogen to iron nuclei. The data collected from the CREAM instrument will be used to address fundamental science questions on the origins and history of cosmic rays. CREAM’s three-year mission will help the scientific community build a stronger understanding of the fundamental structure of the universe. Crystallization of Leucine-rich repeat kinase 2 (LRRK2) under Microgravity Conditions (CASIS PCG 7) will use the orbiting laboratory’s microgravity environment to grow larger versions of this important protein, implicated in Parkinson’s disease. Developed by the Michael J. Fox Foundation, Anatrace and Com-Pac International, researchers will look to take advantage of the station’s microgravity environment which allows protein crystals to grow larger and in more perfect shapes than earth-grown crystals, allowing them to be better analyzed on Earth. Defining the exact shape and morphology of LRRK2 would help scientists to better understand the pathology of Parkinson’s and aid in the development of therapies against this target. Video Caption: ISS National Lab SpaceX CRS-12 Payload Overview: Michael J. Fox Foundation. The Michael J. Fox Foundation is sending an experiment to the ISS National Lab to investigate the LRRK2 protein, a key target in identifying the makeup of Parkinson’s disease. Watch for Ken’s continuing onsite CRS-12, TRDS-M, and ORS 5 and NASA mission reports direct from the Kennedy Space Center and Cape Canaveral Air Force Station, Florida. ASTROTECH SPACE OPERATIONS/KENNEDY SPACE CENTER, FL – The last of NASA’s next generation Tracking and Data Relay Satellites (TRDS) designed to relay critical science data and research observations gathered by the International Space Station (ISS), Hubble and dozens of Earth-orbiting Earth science missions is undergoing final prelaunch clean room preparations on the Florida Space Coast while targeting an early August launch – even as the agency reviews the scheduling impact of a weekend “closeout incident” that “damaged” a key component. Liftoff of NASA’s $408 million eerily insectoid-looking TDRS-M science relay comsat atop a United Launch Alliance (ULA) Atlas V rocket currently scheduled for August 3 may be in doubt following a July 14 work related incident causing damage to the satellite’s Omni S-band antenna while inside the Astrotech Space Operations facility in Titusville, Florida. “The satellite’s Omni S-band antenna was damaged during final spacecraft closeout activities,” NASA said in an updated status statement provided to Universe Today earlier today, July 16. NASA did not provide any further details when asked. Everything had been perfectly on track as of Thursday, July 13 as Universe Today participated in an up close media tour and briefing about the massive probe inside the clean room processing facility at Astrotech Space Operations in Titusville, Fl. On July 13, technicians were busily working to complete final spacecraft processing activities before its encapsulation inside the nose cone of the ULA Atlas V rocket she will ride to space, planned for the next day on July 14. The satellite and pair of payload fairings were stacked in separate high bays at Astrotech on July 13. Alas the unspecified “damage” to the TDRS-M Omni S-band antenna unfortunately took place on July 14. TDRS-M was built by Boeing and engineers are now analyzing the damage in a team effort with NASA. However it’s not known exactly during which closeout activity or by whom the damage occurred. ULA CEO Tory Bruno tweeted that his company is not responsible and referred all questions to NASA. This may indicate that the antennae was not damaged during the encapsulation procedures inside the ULA payload fairing halves. “NASA and Boeing are reviewing an incident that occurred with the Tracking and Data Relay Satellite (TDRS-M) on July 14 at Astrotech Space Operations in Titusville, Florida. The satellite’s Omni S-band antenna was damaged during final spacecraft closeout activities” stated NASA. Once launched and deployed in space they will “take about 30 to 40 days to fully unfurl,” Buchanan told me in the Astrotech clean room. Astrotech is located just a few miles down the road from NASA’s Kennedy Space Center and the KSC Visitor Complex housing the finest exhibits of numerous spaceships, hardware items and space artifacts. At this time, the TDRS-M website countdown clock is still ticking down towards a ULA Atlas V blastoff on August 3 at 9:02 a.m. EDT (1302 GMT) from Space Launch Complex 41 (SLC-41) on Cape Canaveral Air Force Station, for a late breakfast delight. The Aug. 3 launch window spans 40 minutes from 9:02 to 9:42 a.m. EDT. Whether or not the launch date will change depends on the results of the review of the spacecraft’s health by NASA and Boeing. Several other satellites are also competing for launch slots in August. “The mission team is currently assessing flight acceptance and schedule. TDRS-M is planned to launch Aug. 3, 2017, on an United Launch Alliance (ULA) Atlas V rocket from Cape Canaveral Air Force Station in Florida,” NASA explained. The Atlas V booster is being assembled inside the Vertical Integration Facility (VIF) at SLC-41 and will be rolled out to the launch pad the day before liftoff with the TDRS-M science relay comsat comfortably encapsulated inside the nose cone. Watch for Ken’s onsite TDRS-M and space mission reports direct from the Kennedy Space Center and Cape Canaveral Air Force Station, Florida.